We all aspire to work for those ‘hip’ and ‘cool’ companies that appear to have an awesome work culture don’t we? After hearing about Google’s fancy free gym and Airbnb’s $2,000 employee travel allowance, all job seekers are dreaming of working for a company with a similar ethos. In the words of Richard Branson “A happy employee is a productive employee” so it’s in an employer’s best interest to ensure the organisation’s work culture is a good one. To get started on improving your own company culture, here’s a short list of five budget friendly ways. It’s crazy to think that despite working alongside your colleagues for 8 hours a day, 5 days a week, we often actually fail to socialise and connect with each other. 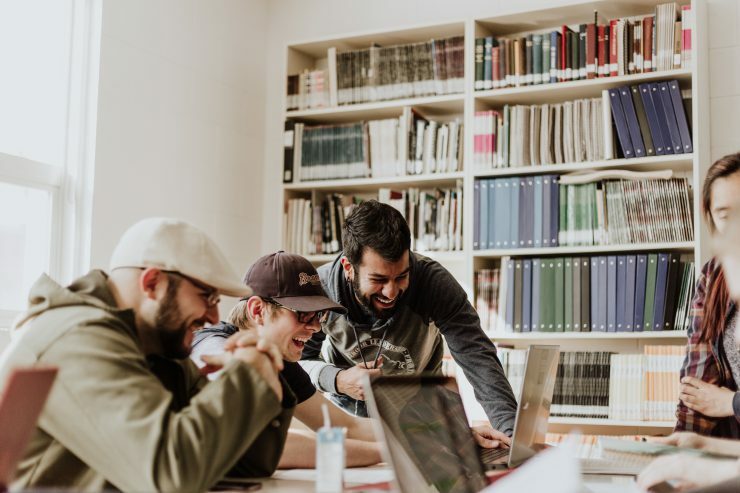 Simply organising group events where teams meet up outside of a workplace setting can help foster a more connected workplace culture. When we get along with our peers, we are much more likely to look forward to collaborating and enjoy our work environment. These socials can range from organised team building activities to a casual meet up in the local pub/bar after work. Find something that suits your team and works for you. Cooking class – because food’s always at the top of our agenda. Escape room – who doesn’t want to be locked in a room with their colleagues? Organised sport – rounders in the park has to be the classic british summer event. Art workshops – get a little crafty and maybe you could have something to pin up in the office. No one likes working under a micromanager – they make you feel undervalued and not trusted. We understand it can be hard to give a lot of flexibility to your team and can involve a significant amount of trust. We’ve all heard those stories of people who claim to be ‘working from home’ whilst actually doing something quite different. But if you trust you team and value their work ethic, remote working and flexible hours can really boost team morale and energy. There has been a long list of studies trumpeting the benefits of flexible working, some even stating that flexible workers were generally a whole lot more productive than their 9-5 peers. If staff members appreciate and value their workplace they are more likely to express this with communicating with others which can enhance the reputation of the enterprise, so it’s a win, win! Encourage employee transparency within your organisation. Promoting an office culture that values transparency is crucial to building trust, balance and productivity among teams within your organisation. Provide opportunities for staff to privately air any concerns with management and let their voices be heard. Sometimes it’s hard for management to always see how employees are, so allowing for some one-on-one time, or offering anonymous surveys to employees can provide an insightful perspective. Adopting fun collaboration tools like slack and yammer help employees easily communicate and keep up-to-date with projects, and can encourage sharing and consistent communication. The Boston Consulting Group conducted an online global study which revealed appreciation is the top factor for happiness on the job. As a result, actively showing gratitude and acknowledging good work is one of the best ways to keep employees motivated. Recognising achievements can come in various forms and don’t need to break the bank, a simple group email or face-to-face thank you can just be enough to remind the employee they are doing well. For larger milestones, physical rewards can be implemented such as gift vouchers or bonus holidays encouraging employees to go that one step further. Who doesn’t love a good employee perk? With competition for the best talent on the rise, it’s important that companies recognise the value of offering perks at work to ensure they are able to hire and keep the best talent for their business. Did you know that Glassdoor’s survey revealed that almost 80% of employees would rather a good staff perk over a salary increase? This is a huge percentage which is only increasing as millennials and gen Zs continue to enter the workforce expecting more than a good salary and 25 days holiday. Perks such as subsidised gym memberships and healthy meals not only benefit the employee but the employer. By offering these perks you are encouraging healthy living and subsequently enabling your staff to be their most productive. Interested in finding out a little more about Cloud Canteen? Visit our website and help feed your team with delicious, healthy meals from the best artisan vendors across London.